Make room, leopard. The newest star of the fashion jungle has arrived: snakeskin print. We’ve been eyeing python pieces in street style photos, our own design studio and at fashion weeks around the world. Reptilian fashion not your thing? Fear not. Three Banana team members tackled this print and gave their spring wardrobe a sartorial bite with our best-selling snakeskin styles. The result is three looks we are wild about. BR: What does your day to day at work look like? Alea: I attend marketing meetings and work with production to make sure everyone has a brand-new, compelling BR email waiting in their inbox each morning. My usual style is glam with a little street-style influence, and I’m always game to try out new trends. Right now, I’m loving animal prints, cabbie hats and bold, bright colors. What snakeskin print piece are you wearing? Today, I accessorized with snakeskin print pieces. I’m in the Demi Snake Print Slide and Snake Print Trouser Belt, and I added my Vegan Leather Medium Zip Pouch (a holiday gift)! How did you style them? When getting dressed this morning, I stuck to neutral pieces to make the snakeskin print pop. 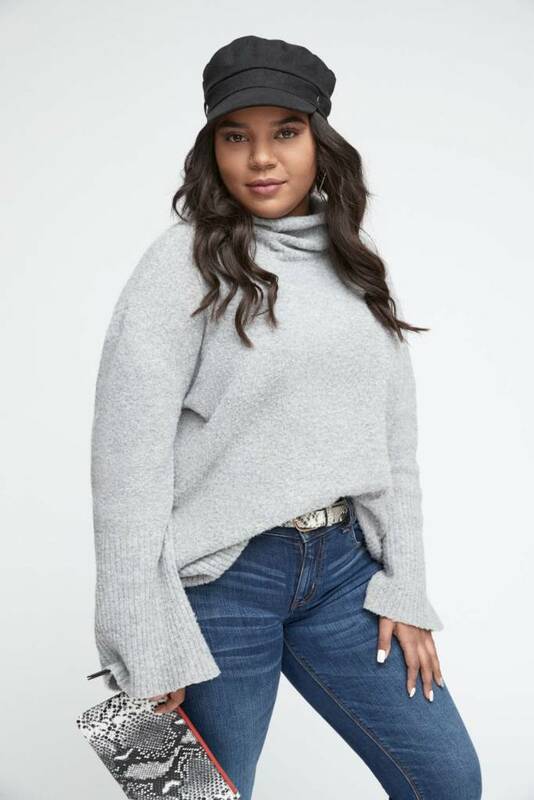 I’m in a chunky oversized gray sweater and dark-wash flare denim. I topped it all off with my signature cabbie hat. I opted for smaller, more subtle snakeskin print pieces but then chose neutrals to emphasize them! How would you style snakeskin print for work? For a night out? I like the pop of excitement snakeskin accessories brings to an outfit. Because of the print, I’d let my accessories do most of the talking for my outfit. For work, I’d wear a white blouse, black skinny jeans and a snakeskin print belt or shoes with a red work bag. For a night out, I’d pair a crossbody snakeskin print bag with dark-wash distressed jeans, a black bodysuit and a black leather jacket–finished with a pair of red heels! How would you mix snakeskin print into your current wardrobe? 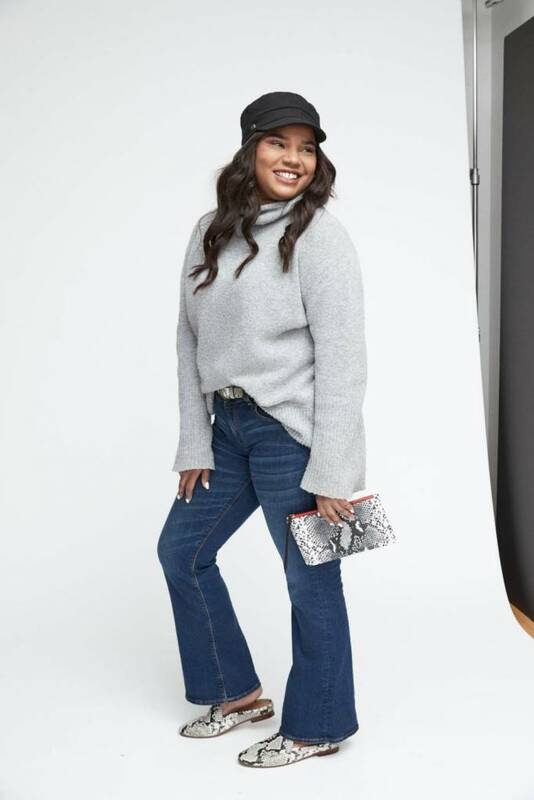 I’d style these accessories with a tank and jeans for going out, or a sweater and pants for work–using the snakeskin print piece as the “pop” for the look. For other snakeskin printed pieces, I’d probably mix and match texture with leather leggings and red booties for a night out in the city look. For work, I’d pair snakeskin with a tan peacoat, loafers and a button-up shirt. 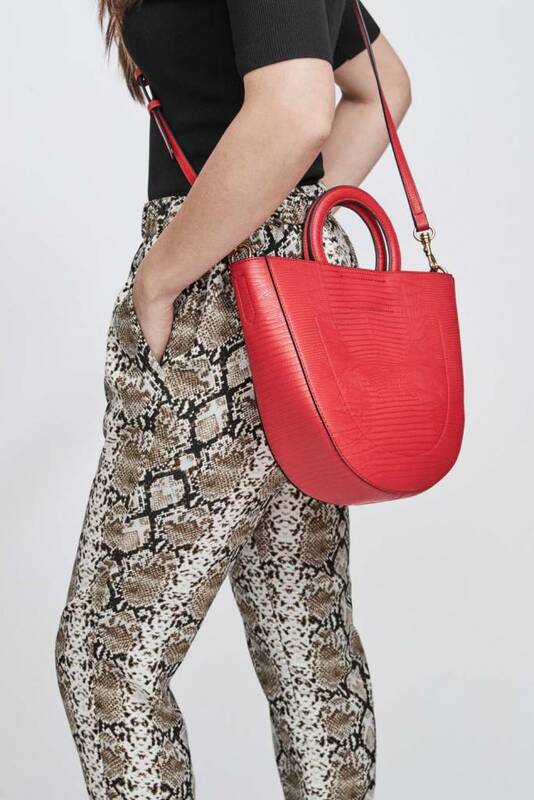 Shop Alea’s look: Demi Snake Print Slide, Snake Print Trouser Belt, similar bag here, similar sweater here, similar jean here. Heather: I spend a LOT of time talking! If I’m not on the phone talking to potential candidates, I’m in meetings with my business partners. I usually go for a look that is clean, polished and feminine. Which snakeskin piece are you wearing? I’m wearing the Snake Print Pleated Midi Skirt. I love the femininity of this flowy skirt, and the snakeskin print adds just the right amount of edge. I paired the snake print skirt with our Washable Merino V-Neck Sweater and our Leather Moto Jacket. I’m in an off-white leather pointy-toe mule, and I topped everything off with a gold chain-link and white stone vintage Banana Republic necklace. I would definitely wear this outfit to work. It’s not only stylish, but it’s comfortable, too. For a night out, I’d change into a black simple strappy heel, a black top and add a bold statement earring. I would incorporate a lot of white for a more casual look–such as a crisp white button-up, or a white graphic t-shirt. I love to pair oversized sweaters with midi skirts, so that would definitely be happening. As for shoes, slides, our Bare High Heel Sandal, or our Essential Leather Sneaker would all be cute combinations. I might add a pop of color like yellow, orange or silver with accessories. The print itself is very versatile and fun. I would wear snakeskin print as a statement piece with more classic pieces to give it a sophisticated, put-together look. Or, I’d add snakeskin print as an accent piece to almost any outfit. A cute clutch, sandal or pump in this print would bring any outfit together. Shop Heather’s look: Snake Print Pleated Midi Skirt, Washable Merino V-Neck Sweater, Leather Moto Jacket, similar shoe here. Andrea: No one day is the same–which is what I love most about my job. It’s hard to target one style! I usually tend to lean towards a more modern, monochromatic look, but some days I find myself in a floral dress or even snakeskin-print pants. Which snakeskin print piece are you wearing? 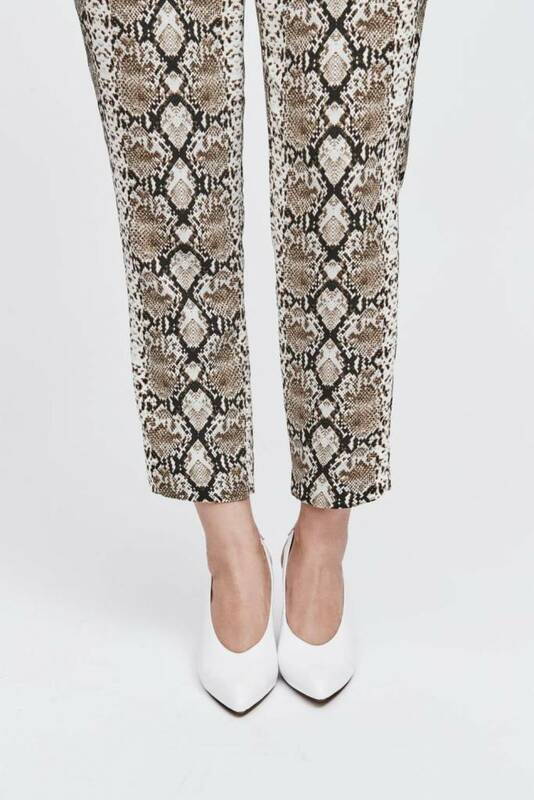 I am wearing the Hayden Tapered-Fit Pull-On Ankle Pant in snakeskin print. Today, I chose an easy white slingback heel, an off-the-shoulder black top and a black leather jacket. I chose neutrals because the pants are a statement print! My red handbag adds a nice touch of color to my look, and it’s actually also a BR piece. For work, I would tend to wear flats or sneakers (I’m a lazy commuter and tend to not change my shoes) but for a night out I would pair these with a pair of fun heels! I would pair these pants with a more fitted top for a more put-together look, but also love the idea of wearing them with vintage tees for a more contemporary look. I absolutely love the versatility of them. You can easily pair with heels, booties or sneakers. I love animal prints, like snakeskin or leopard. It seems to always be relevant and can easily mix into any wardrobe. Shop Andrea’s look: Hayden Tapered-Fit Pull-On Ankle Pant, Vegan Leather Circle Handle Bag, similar shirt here, similar jacket here, similar shoe here. Loving the snakeskin print trend? Explore this print and more in our Trending Now: Animal Print shop.